There’s nothing more personal than a handwritten letter, but few of us can find the time to write these days – especially if you can type quickly. So what’s the second most personal touch you could put on your correspondence? 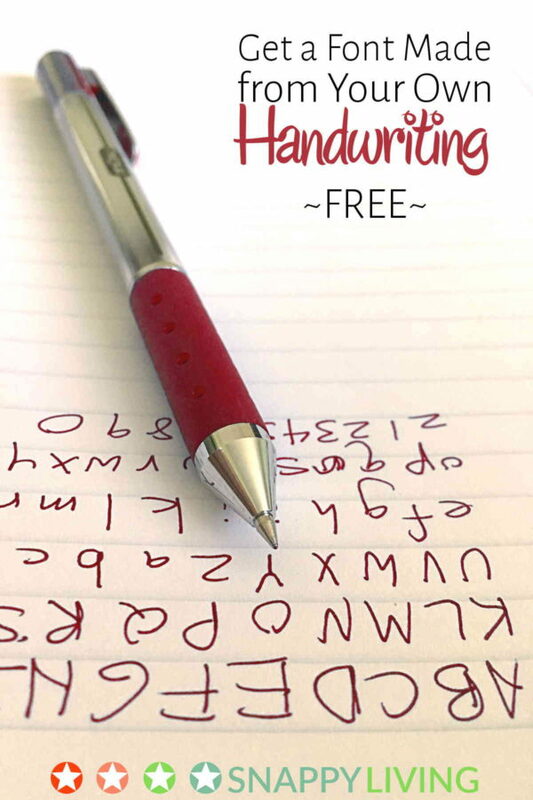 A handwritten font in your own handwriting. It’s also perfect for digital scrapbooking, so you have the look of your own handwriting on the digital pages. These fonts also make cool gifts. If you can get a sample of the recipient’s handwriting, you can have a font made for them. There are a number of online sources that make it quick, easy and inexpensive. This is also a wonderful way to allow someone who’s become disabled to be able to produce documents in their own handwriting. You can actually do this for free. You will need a scanner to create a PDF file of your handwriting for uploading and a thin felt tip pen or marker. MyScriptFont.com gives you a template to download and print. You upload the template, and it spits out a font based on your handwriting. This is 100% free, and as long as you follow the instructions, you should get a good result that will work on whichever computer format you chose. Fonts For Peas gives you a template just like MyScriptFont, and you email that to the site’s owners. If they choose your font, they generate a personalized font, 100% free, which may also be available to others on their site. Your font will work on Windows or Mac. Please note the site states they may not choose to make every template into a font, and those they do make will be distributed as free downloads to everyone on their site. Fontifier does the same, except it costs $9. You do get to preview the finished font before deciding whether or not to buy it. I’d suggest trying the free one first, then if you don’t like the results, give this one a whirl and see if it’s better. YourFonts works pretty much the same way as Fontifier, but it’s $9.95 and they promise the font will work on Windows, Mac and Linux. Oh, yeah, there’s one other really great use for personalized handwriting fonts: holiday cards, especially for businesses! Some offices have one of their employees handwrite hundreds of addresses on envelopes around the holidays because they want the cards to have a personal touch. Great thought, but having the computer do it for you would be even easier. And quicker. Even for households with many cards to send, this is a great way to get old-fashioned (looking) results in digital-age time. Remember, if you want to send an email in your personal font, the recipient will need to have your font loaded on their system as well. Otherwise, they will only see those rectangles on their screen. The free one is $9.95 now. Thanks for the catch, Mama! I found another free one to replace it (though they don’t guarantee they will do every font submitted). Another site to add to this list is http://www.FontPanda.com. They will make a font from your handwriting for free. They use the same technology as YourFonts so their fonts look really good. You can also download a bunch of free handwriting fonts made by other users. Enjoy!